Perfect decisions quick and easy! 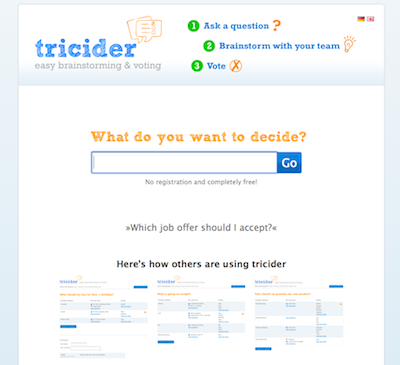 tricider is a free Tool to make decisions in a team. Ask a question and send a link to friends or colleagues. Everyone may propose a solution or post arguments for an idea. Finally, you vote for the best solution. Plan a trip with friends, make decisions at work or try to sort your thoughts on a peculiar problem: you will find the best solution with tricider. tricider is the first tool that combines brainstorming and voting and its so easy.